I have had an on-off love affair with dance my whole life. After renouncing ballet at the age of four when asked to wear a pink tutu, I did a bit of jazz and Irish dancing as a kid. My family lived overseas while I was young, and I continued to dance in musical theatre and school shows. However, through those awkward growing years overseas where it felt like my body was trying to become a giraffe, I lacked the confidence to pursue dance in its own right. 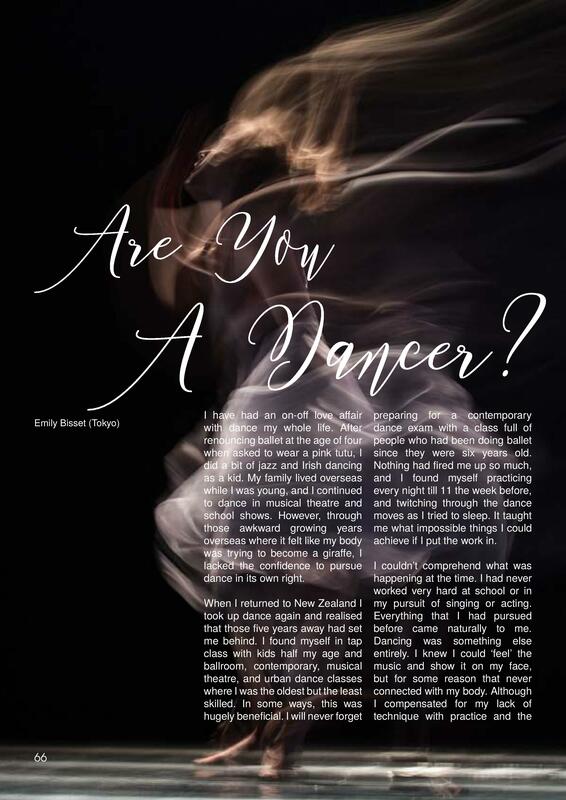 When I returned to New Zealand I took up dance again and realised that those five years away had set me behind. I found myself in tap class with kids half my age and ballroom, contemporary, musical theatre, and urban dance classes where I was the oldest but the least skilled. In some ways, this was hugely beneficial. I will never forget preparing for a contemporary dance exam with a class full of people who had been doing ballet since they were six years old. Nothing had fired me up so much, and I found myself practicing every night till 11 the week before, and twitching through the dance moves as I tried to sleep. It taught me what impossible things I could achieve if I put the work in. I couldn’t comprehend what was happening at the time. I had never worked very hard at school or in my pursuit of singing or acting. Everything that I had pursued before came naturally to me. Dancing was something else entirely. I knew I could ‘feel’ the music and show it on my face, but for some reason that never connected with my body. Although I compensated for my lack of technique with practice and the performance skills I had gained from musical theatre, it was hard always feeling behind. I loved the performances but watching them afterwards was difficult as I was that kid who was always just a little behind and off balance, never as flexible or sharp as the others. After an unsuccessful year pursuing a classical singing degree I questioned myself. Why had I never felt inspired to stay up all night practicing singing as I had dance? I ended up pursuing directing in media rather than singing, which certainly excited me in the same way as directing and dance had previously, but dance was still on the back burner. Heading into my final year at university something monumental happened. On a fateful afternoon as my best friend and I sat watching random YouTube videos, something new popped up. It was Mirotic by TVXQ. I didn’t know what was happening but suddenly very attractive men were dancing beautifully on my screen and I was hooked. It was K-pop! Dancing is a requirement in K-pop, and is linked to the music, videos, and culture in a way I had never seen before. Directing music videos in the Asian market became my dream, and as I’d had a fascination with Japanese media since seeing the works of Hayao Miyazaki at a young age, naturally I decided to apply for JET! 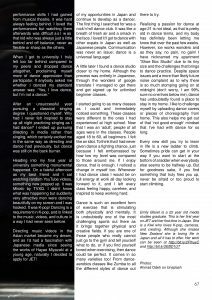 I knew I wanted to make the most of my opportunities in Japan and continue to develop as a dancer. The first thing I searched for was a rock’n’roll dance club. It was like a breath of fresh air and a smack in the face. I loved it! I got to dance with other expats in Japan as well as Japanese people. Communication was never an issue: dance is a universal language! A little later I found a dance studio closer to my home. Although the process was entirely in Japanese, through the wonders of google translate I managed to get there and get signed up for unlimited beginner classes. I started going to as many classes as I could and immediately noticed something. These classes were different to the ones I had experienced at high school. Now that I was an ‘adult’, people of all ages were in the classes. People aged 18 to 60, all beginners. I felt like an idiot. To think that I had never given dance a fighting chance, just because I felt embarrassed by how low my level was compared to those around me. If I enjoy dance, that is enough. I noticed a change in myself too. Whenever I had dance class I would be on full energy at work all day looking forward to it, and I left every class feeling happy, carefree, and inspired to keep working hard. Dance is such an excellent form of exercise that is stimulating both physically and mentally. It is undoubtedly one of the most challenging sports out there as it brings together physical and creative fields. If you are one of those people who really cannot just go to the gym and tell yourself what to do, or if you find yourself bored when exercising, then dance could be perfect. It comes in so many varieties too! From dance-aerobics classes like Zumba to all the different styles of dance out there to try. Realising a passion for dance at age 21 is not ideal, as that is pretty old in dance terms, and my body has definitely been letting me know that over the past few weeks. However, ice works wonders and as they say, no pain, no gain! I have nicknamed my apartment “Shoe Box Studio” due to its tiny size and the challenges that brings to dance practice. 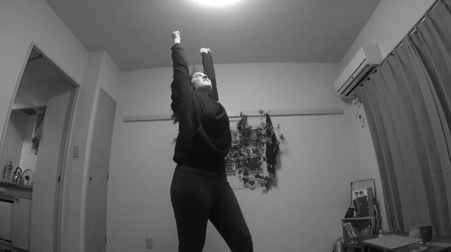 Despite space issues and a more than likely future noise complaint as to why there is so much stomping going on at midnight (don’t worry, I am 99% sure no one lives below me), dance has undoubtedly found a place to stay in my home. I like to challenge myself by uploading dance covers or pieces of choreography from home. This also helps me get out of that ‘not good enough’ mindset that I’ve had with dance for so long. Every new skill you try to learn in life is a new ladder to climb. Sometimes pride can get in your way if you want to start at the bottom of a ladder when everybody else seems to be halfway up. But for goodness sake, if you find something that truly fires you up, never be afraid or too proud to start climbing. Emily Bisset is a 22 year old media studies graduate. This is her first year on JET and her first time in Japan. She is a Kiwi who loves K-pop, cameras, and creating. Although she misses New Zealand she is loving life in Japan and all it has to offer. Her work can be seen on YouTube and on Vimeo.